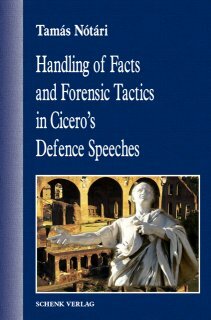 The present monograph intends to get closer to understanding the mechanism of operation of this impact by analysing ten pieces of the orator’s life-work more profoundly from legal and rhetorical aspects in terms of the lawyer’s handling of the facts of the case and rhetorical tactics applied by Cicero in these speeches. As they are oral pleadings and statements of the defence, the ten speeches have been grouped according to the facts of the case that provide grounds for the charge, and the chronological order. The speeches given in defence of Sextus Roscius from Ameria in 81 and in defence of Aulus Cluentius Habitus in 66 were delivered in lawsuits brought by the charge of homicide (parricidium, veneficium). The speeches held in the lawsuit of Lucius Licinius Murena in 63 and in the lawsuit of Cnaeus Plancius in 55 were delivered in defence of future magistrate having won the election but charged of election bribery by competitors defeated in the fight for the office. The speeches given in defence of Marcus Caelius Rufus and Publius Sestius in 56 and in defence of Titus Annius Milo in 52 were made in a lawsuit brought by the charge of vis (publica) that covered a general group of crimes that comprised several state of facts from violent disturbance of public order to certain cases of manslaughter. The three speeches discussed in the last chapter (the so-called orationes Caesarianae, i.e., Pro Marcello and Pro Ligario given in 46 and Pro rege Deiotaro) are arranged not so much around a single state of facts, instead, they are connected by the fact that the addressee of all the three speeches is Caesar.